Hiii friends today I am back with a interesting Tutorial. In this I will teach you how to get ultoo free Re. 1 daily Recharge By Without Doing anything(Typing SMS, Inviting people). It will Daily send 50 SMS Automatically, Without doing anything (Typing SMS, Inviting people). After every 10 Days check your Balance It will be Rs 10. STEP 1. Download This Script.Go to http://byethost.com/free-hosting/news and register for new account. STEP 2. After Registering Confirm your account by going to your email and check in Spam Folder you will get a mail open that mail and and click on the confirmation link. After that you will be redirected To Activation page, don't do anything just click on Click me TO continue Button. STEP 3. Now, byethost will provide you your hosting details just note that. STEP 5. Login using your Control Panel User name and password and after that you will redirect to dashboard. STEP 6. Then under File Management Click on Online File Manager.After that you can see 1 directory there name "htdocs" click on that then there you can see 2 files delete "index2.html" file. STEP 7. Now its time to upload files which we have download at STEP 1 .CLick on Upload Button and select files from your computer and click on correct button to upload. STEP 8. 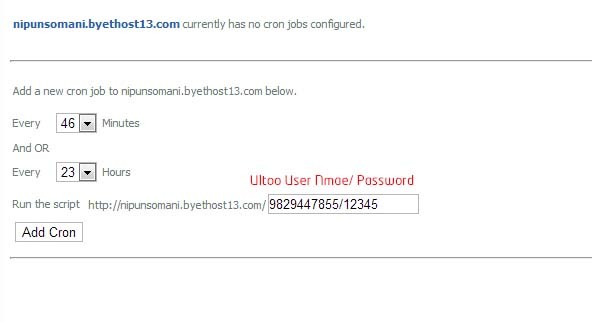 After uploading Go back to DASHBOARD and under Site Management Click on Cron Jobs and then click on Alter Crons and then you will taken to a page where you need to set the url. STEP 9. Now in Minutes Select any Number between 30-60. And in Hours Select 23. Now in Run the Script Write your user name and password. In user name type your ultoo registered mobile number. STEP 10. Click on Add Cron. And you have done Enjoy!!!!!!!!!! Now you don't need to send sms every day and invite friends. it will automatically send 50 sms a day. and you will get RE. 1 per day. You can check daily you will get Re 1 . NOTE=====>> You Can Add as many Accounts you want.